Need advice about a specific Ford F-150 problem? Chart based on 146 repairs. See TSBs and recalls for the 2015 Ford F-150. Chart based on 59 repair trips. The repair cost chart excludes repairs made under warranty, do-it-yourself repairs, and repair trips that include maintenance. 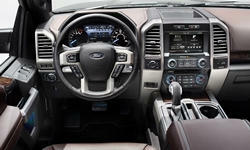 See repairs for all Ford F-150 model years. 35960 mi Rear axle housing gasket leaking-resealed. 19000 mi Engine light code triggered - P2450. R/R 2 pc drive shaft Lowered fuel tank and replaced EVAP blocking valve. Oil change and repair took approx 2 hours - expedited. There is a TSB for the repair. 15000 mi Had to replace gasket and latches on driver side doors related to a known issue with 2015/2016 f150s. Also had an update done to the automatic transmission system to fix hard shifting from 5th to 4th gears etc. 61380 mi Leaking axle seal. Seal replaced. It was a seal on the rear differential. It was covered under warranty. 34100 mi Interior door panel. The door handle had faded where your hand grabs the door to close it. Likely a reaction to skin oil? US $100 Replaced a coil in one of the cylinders. 12400 mi Drivers side doors had wind noise at highway speeds. They made alignment adjustments. It's better, but not perfect for sure. 13200 mi Backup camera occasionally fails. Updated Sync system. Repair unsuccessful. Always just the backup camera. Other 360 degree cameras always work. 35999 mi Backup camera failed to display in cold temps. Replaced defective APIM. Sunroof drain tube came apart. Water got under carpeting. Ford replaced all carpet and padding after they repaired the faulty sunroof drain. 20000 mi headliner at driver side has separated from trim. Realigned. US $150 Driveshaft had a vibration which started at around 45mph and continued up to 65mph. Dealer replaced driveshaft under powertrain warranty. Issue resolved. License plate bulbs burned out at 58,500mi. Needed to be replaced. Fuse ended up blowing, and caused brake running lamps to go out completely. truck was not safe to drive. 23700 mi Door check replaced. Drivers window replacement due to delamination. 42000 mi Steering wheel finish coming off. Not covered since I'm ove r my 36k b2b. 11800 mi 1 back-up sensor was too sensitive, went off too early. 23000 mi Door locks were freezing up in cold weather. TSB out for this concern, and parts are on order. 4.9 hours labor, glad it's under warranty! 26000 mi Parts for door locks only came in after I'd gotten rid of the truck. 27000 mi IWE's were replaced after complaining for a long time about a faint sound like there was piece of a soda can stuck in the front left wheel hub. The sound was consistent with the rotational speed of the wheels and was most audible around 45mph. It was not a loud grinding noise that sounds like you have knobby tires when you don't. It was a faint sound but it drove me crazy. The sound was still there after the IWE's were replaced on both sides. In the same visit I also had the following problems addressed: 1.) The parking break foot pedal seemed like it was catching on something when I pressed on it. That was fixed. 2.) There were a couple of random creaking sounds in the dash which were also fixed. 3.) One of the power windows would randomly reverse direction when moving up. That was fixed. 36000 mi One of the IWE's (I think it was the front right) failed after using 4H in a snow storm. There was a loud grinding noise that sounded like I had mud tires on even though I didn't. This is an on going problem with a lot of f-150's, so much so that my service writer told me there was a national shortage of IWE's for f-150s!!! Since then I have felt somewhat skeptical of the Ford brand. However, since this last repair the IWE's seem to be holding out just fine. I guess we'll see what happens in the long run. I did have to use 4H again for another really bad snow storm where I drove about 15 miles on snowpacked roads going about 20-30 mph. 16000 mi Message while pulling a trailer with brakes "trailer disconnect" would appear randomly. No problem with trailer could be determined. Have not pulled the trailer since reprograming of trailer module per TSB implemented. Since reprogramming indicated in initial description, I have driven with the trailer over 1000 miles with no further difficulties. Low pitched rattle in driver side door or door post. Could not be repaired at the time of initial appointment. Door rattle was diagnosed and repaired by dealer. Satisfactory resolution. 13000 mi Speedometer went wild after passing a slow car. Needed new instrument cluster. US $190 Rusty piece of break pad broke off and scored/warped rotor. US $73 Noticed the AC was making a mildew/moldy smell when first turned on. Only happened with AC but not vent w/o AC. Dealer determined it was the cabin air filter (it was black) and also noted the engine air filter was black. Both were replaced, and dealer used an "AC scent kit" to clean out residuals in the system. Also mentioned a periodic shimmy in the motor when idling maybe every 10 seconds, very minor but asked for it to be checked. No issues were found related to this, no repairs performed to resolve this (truck still has periodic shimmy). 7020 mi Vibration at 80 to 90km/hr on slight acceleration, uphill or maintaining speed. Dealership reports that all vehicles have this vibration. Test Drove another f150 ecoboost & a 5.0l. Vibration is present in all vehicles. 69440 mi Vibration felt in cabin, replaced rear end gears. 13000 mi Steering wheel vibration during auto-telescoping movement when turning car on or off. Turn signal also did not disengage about 30% of the time after left turns. Steering wheel mechanism was lubricated and adjustment made to turn signal lever mechanism. Operating correctly now. US $280 New rear rotors, should have been replaced when the pads were. US $108 Sun/Moon roof tracks broke. Replaced entire track system. Repair not done well. The power running boards seized up. Replaced the motor and hinges on both sides of the truck. 8100 mi Key fob quit working after 4 days of owning truck. Took to dealer replaced fob battery still wouldn't work. Took to dealer left for 2 days, nothing done. Took back to dealer 1 day, fob bad, back ordered. 7000 mi Vacuum wasn't engaging the left front axle correctly. 28000 mi Nav SD card quit working. Fortunately it was still under factory warranty. 57000 mi Also could not get wind noise out of driver's door fixed. 6000 mi The active cruise control and collision warning are alerting when there isn't any danger. As of now Ford as an update but it still doesn't work properly. In fact, the update further messes up the system. 11000 mi Engine coolant all over the driveway.Towed it in to be safe. Found a leaky water pump, replaced that and power-washed the engine and undercarriage. This repair occurred in June 2015. A/C system had a burning smell, really strong after a burst of acceleration or while towing. Dealer checked for any leaks and found nothing wrong. Smell persists to this day on occasion. Reflash for driver alert/distronic cruise control. 12000 mi Battery dies if siting for more than two days. Dealer replaced the battery. After repair both rear power windows would not work. Dealer replaced a body control module. 14000 mi Truck had a noise from 25 mph that would go away at 60 plus. I thought it was electronic of nature. Turn out it was the transfer case!! Ford had these on back order as its a common issue. 15000 mi Cooling seats would cool for about 5 minutes then start to get hot. Dealer replaced the control module. 19000 mi Driver side headlamp accumulated moisture. Ford replaced the entire assembly under warranty. 23900 mi Check engine light. 11000 mi Downshift and Upshifts from 4-5 were violent and long. They reflashed the ecu and said it was related to a tsb. Didn't do anything though. Will bring it back in. 2800 mi Passenger massaging seat lumbar bag had a hole in it causing a hissing noise and the air pump to run every time the truck was started. Replaced under warranty. 16000 mi Shifting hard "Clunking"
1000 mi Moonroof leaked into interior. Drain hose kinked. Hose repaired. Parking brake controller replaced (corrosion from water). Right rear door creaks on rough pavement. Door check determined to be faulty. Parts on order. 5000 mi Door check from previous visit installed. 26778 mi Front rotors had warped. They were replaced. US $400 Front passenger shock was leaking. Shock replaced, alignment required (and performed). Rear differential seal leaking. Seal replaced. 12000 mi Ck engine light. It was bad vapor sensor in fuel filler pipe. 22000 mi Returned from Dr, started truck: Warning message appears "Emergency Brake Failure: Service Now: Do Not Drive. Truck towed to dealer by Ford Roadside Assistance. Dealer sees the error code but finds no issue with system. Numerous low voltage codes. Battery Voltage weak. Dealer keeps it overnight. Next morning, they find everything back to normal. They find no voltage bleed, all errors cleared and run through a comprehensive computer diagnostic while driving. Ford Tech gives it a pass, and no further error codes are thrown. 13132 mi Right turbo oil pressure sensor came out of housing causing loss of around a quart of oil. 26000 mi P2450 CEL repeatedly came on. Took to dealership, and they replaced the evap. blocking valve on the fuel tank. 20259 mi At oil change performed by dealer, noticed oil minor oil seepage from rear of oil pan. Was advised by service advisor repair would be under warranty and was covered by TSB issued by Ford Motor Company. Part(s) ordered and vehicle taken to dealership for repairs three weeks later. The oil pan was replaced with 'different' design pan, oil changed and florescent dye installed to detect future leaks. 25000 mi January 2017 informed TSB needed to be performed to repair oil seepage from oil pan. TSB performed in January by this dealer. When returned for re-occuring CEL and to repair TSB, was informed the 'old style' oil pan had been installed instead of replacement. I requested my oil be installed at time of service and provided oil and filter to dealer. Two day shop stay to obtain sensor and when service advisor called, he said Ford oil had been installed. and mine would be returned. Following day when I got to dealer, was advised they had gone ahead and drained oil, replaced filter and presented me with $70 bill for oil change, since service lane had not performed 'oil change', got the shop rate. Still wondering why a dealer would charge for their error. Just glad I didn't have to pay for another oil pan as that was their error also. CEL illuminated. Stopped @ first dealer, diagnosed Pssgr bank 1 O2 sensor defect. Reset CEL, told me if re-occured, parts should be available in DFW metrop[lex. Also informed oil pan seeping from rear main saddle (previously repaired), and record showed 'fix', but wasn't. CEL Illuminated enroute, stopped at first dealer, diagnosed only. CEL reset, proceeded and re-illuminaated 146 miles later. 33600 mi THIRD return trip to repair oil leak from TSB issued by manufacture. 58000 mi Yellow wrench light accompanied by loss of power (limp mode). Dealer was unable to pull codes, even with wrench light active. Dealer was unable to exactly reproduce the problem. A PCM update was available and was applied. All related systems checked but appeared normal. 7000 mi glass for instrument cluster had a digital transfer of paint in corner. Second cluster glass had scratches in the middle. Getting third glass installed tomorrow. 18000 mi Defective battery. Under warranty. 4000 mi engine oil leak. Oil sender unit was loose and re-torque. 37000 mi Bliss system not working properly. Dealer had to order parts. 6200 mi outside temp shown was not accurate at all times. It seemed to be stuck on a set temp. 3000 mi Check engine light. Fuel valve in tank failed. 18311 mi Code P0C2A - Auxiliary Transmission Fluid pump motor stalled. Auto stop-start stopped working. 8000 mi Tail gate hinge bushing damaged from freezing. 21000 mi Noticed oil leak under engine where I park. Dealer found oil pressure sensor was loose from factory. Tech resealed sensor. This seems to have corrected leak. I will continue to watch. 14260 mi Power lock on rear passenger door. Corroded parts, broken power lock. US $80 Rear passenger window switch quit working. Internally broken, felt mushy and didn't operate the window. 22000 mi Rear power sliding window defroster stopped working. Sensor found bad, rear window assembly replaced under warranty. 2000 mi Dealership replaced defective steering column under warranty. 3000 mi Intermediate shaft replaced due to persistent creaking noise. Actually the fourth repair attempt. 10200 mi Transmission was occasionaly shifting down with a "bump". Computer was reflashed per a TSB. Problem corrected. 11800 mi Steering wheel pulled the direction of last turn. Rack and pinion replaced. 8300 mi Dash was warped and had a rattle in the mirror. 5000 mi Leaking Oil, Found out the oil pan gasket needed to be replaced. 10000 mi Drivers door will not latch in cold weather. Dealer found a TSB for this issue but did not replace parts as directed. Dealer did not repair issue and door still doesn't latch when cold. Windshield washer fluid pump not working. Dealer said the line was frozen but the problem continued after the weather warmed. Returning to dealer along with issue with drivers door that was also not correct on first visit. 12400 mi Replace windshield washer pump. 14000 mi My check engine light came on. Code showed cam position sensor not synchronized. They replaced an actuator and it stayed off for a week. It came on again and they replaced cam phasers. It seems to be fixed now. My check engine light came on. Code showed cam position sensor not synchronized. They replaced an actuator and it stayed off for a week. It came on again and they replaced cam phasers. It seems to be fixed now. 7000 mi occasional hard downshift at low speed. Dealer updated transmission software per TSB. Sep 2015 Hinge bolts were found to be loose from the factory. 33000 mi Heavy clunk on downshift when coasting. Software flash seemed to fix issue. 45000 mi Replaced valve bodies for intermittent hard shifting when hot. 2000 mi Had to replace a sensor so the check engine light would stop coming on. See our lemon odds and nada odds page to see vehicles with no repairs or vehicles with more than three repairs. 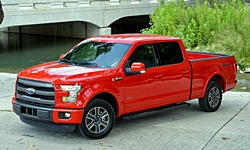 To see how frequently 2015 Ford F-150 problems occur, check out our car reliability stats.